Cookies! Who doesn’t like cookies? Cookies are one of the Monkey’s favorite treats especially when combined with a coconut milk hot chocolate. I wanted to share with you one of his favorite cookies that I make on a regular basis. These are gluten,dairy,nut, and soy free and are delicious. When creating this recipe I wanted something that would be ideal for school lunches or easily tucked into my purse for a quick afternoon treat if we are out and about. These do just that. 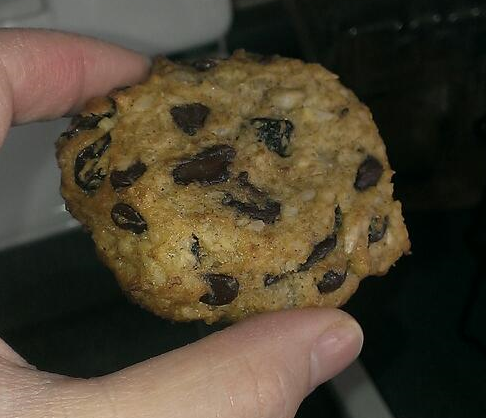 The cookie itself has a soft chewy texture a lot like an oatmeal cookie but without the oats. The banana’s help increase the cookies sweetness without the need for copious amounts of added sugar which is always nice. Mash together bananas. With a stand or hand mixer in a medium sized bowl (or the bowl which comes with your stand mixer) mix together the mashed bananas, oil, eggs, sugar and vanilla until fully incorporated about 1 min. Add in the cinnamon, baking soda, xanthan gum, white rice flour, coconut, sunflower seeds, raisins and chocolate chips. Mix together with mixer or by hand. Drop by rounded tbsp. onto non-stick cooking sheet or parchment lined sheet and then press down to flatten. Bake about 12 – 15 min till under sides are golden brown and tops have started to brown slightly. P.S I promise to take better more detailed pictures in future.